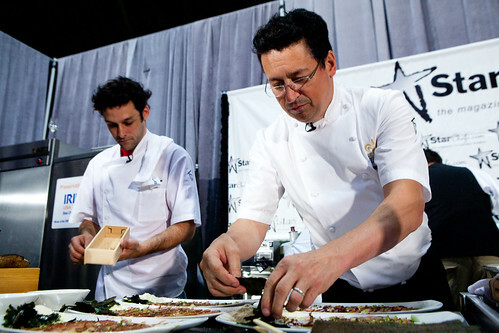 Day 2 of StarChefs.com International Culinary Congress (ICC) was another food-filled day – information-wise and the actual eating of food. As every day of those three days of ICC, it starts early around 8:30 AM. Thank goodness for Nespresso to provide the caffeine that I personally think every sponsor and attendee needed. The morning kicked off by continuing to round 2 of the 1st Annual Pastry Competition, all about plated desserts. 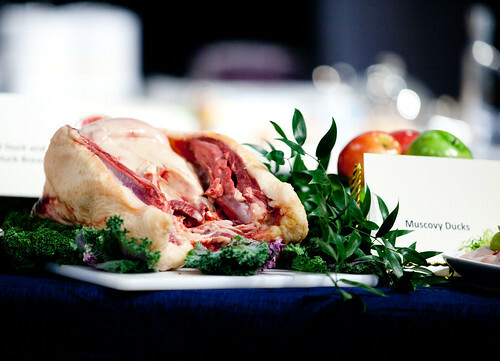 I didn’t stay too long since I attended Executive Chef Dan Hunter of Royal Mail in Dunkeld, Australia‘s workshop. 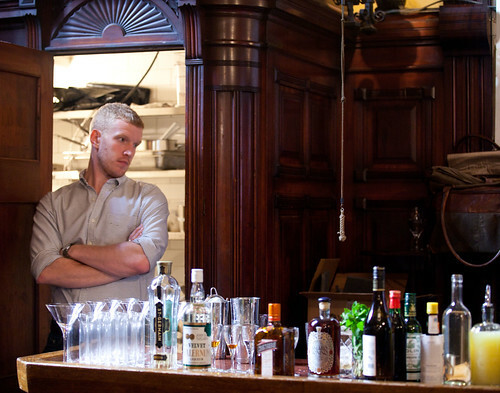 Hunter is a very good, if not great, chef. 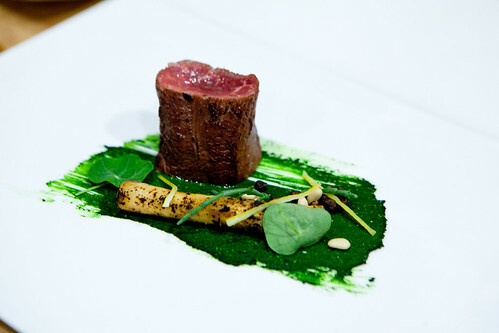 He demonstrated a dish he cooks at his restaurant called lamb, eggplant in white miso, pine nut, chlorophyll. Whilst telling the twenty or so of us how he cooks it (most of the elements were by sous vide, then roasting briefly and then blowtorch it so the meat will not get that gray ring, indicating it is overcooked). As his assistants pass out the separate cooked elements of the dish for us to sample, most of the salt is coming from the white chocolate miso sauce. And yes, the sous vided baby lamb was tender as it could be. It is delicious as it is beautiful. 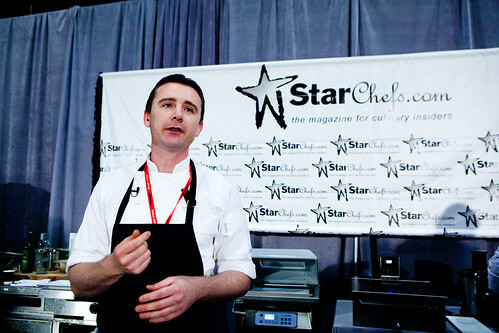 At the conclusion of this workshop, Hunter was relieved it was over, as he admitted to StarChef’s Editor in Chief Antoinette Bruno that he was nervous (it does show during his workshop) to speak even to a small group of 20-25 people rather than a larger audience at the Main Stage. Poor thing, I really did wanted to give him a hug. Right afterward, I went over to the The Pig Whisperer: Working Magic with Pork workshop hosted by Executive Chef/Owner Normand Laprise and Chef de cuisine Charles-Antoine Crete of Toqué! in Montreal, Canada. Heard rumors before the workshop started that they are zany and it is true. They are very loquacious bunch of Canadians and boy, don’t they love their pork. 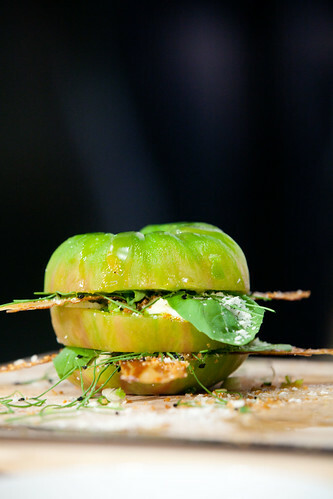 They have demonstrated and served in family-style portions of their spin of the BLT (bacon, lettuce, and heirloom tomato). It is a huge (I’d guess a 1.5 pound to 2 pound) ripe heirloom tomato cut across and filled with strips of fried bacon in between and seasoned with salt and pepper and a sprinkling of breadcrumbs. 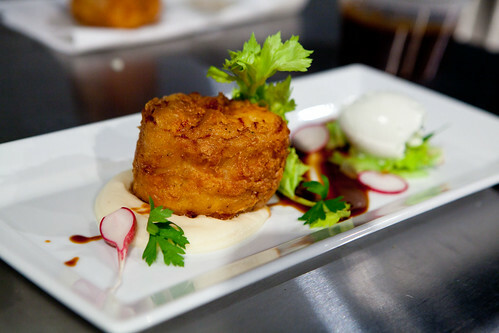 (Since Chef Laprise has celiac disease, there wouldn’t be any breadcrumbs on his personal dish.) 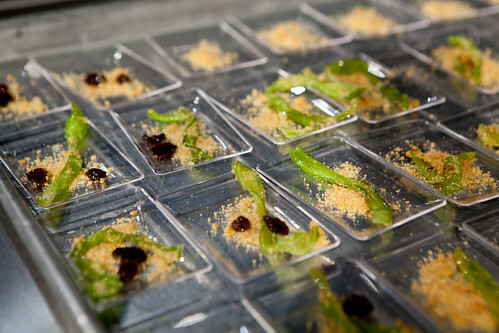 While they were presenting the BLT, their sous chef brought out a large sheet tray heaping full of pork cracklings. 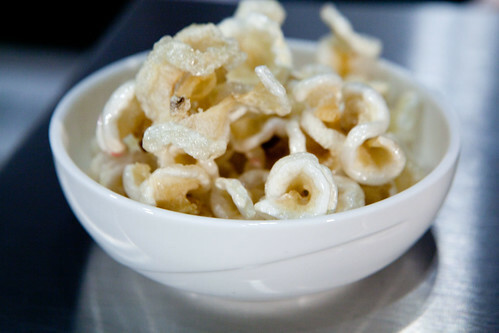 The cracklings were light, airy and addictive like potato chips. 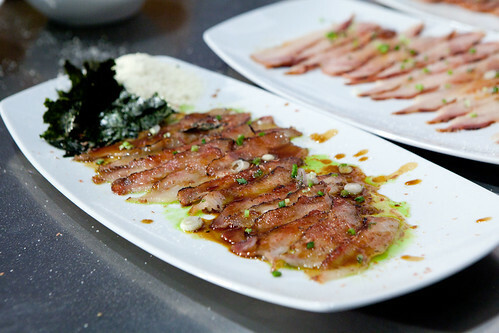 Then moving to the last dish of the hour, they cooked pork belly (by blowtorching it) and have a Japanese spin to it with the nori (seaweed) and added on molasses and basil oil. This last dish was a winner – a combination of sweet, salty, sort of iodine flavor from the nori, and the pork belly was the luscious, fatty container to support it all. 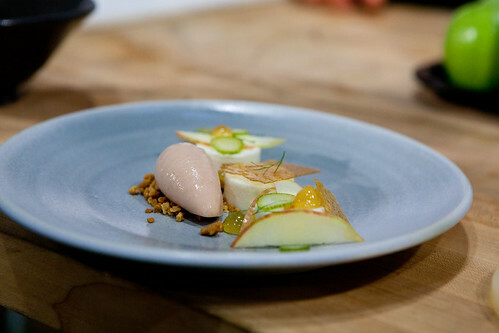 I caught the last fifteen minutes of Pastry Chef Patrice Demers of Les 400 Coups, Montreal, Canada pastry workshop: Apples in the Big Apple, as his other Montrealers finished a bit early. 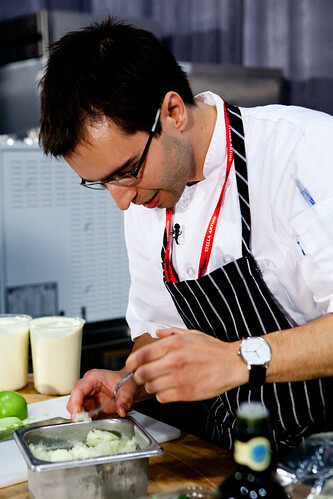 I found Chef Demers’ personality similar to Chef Hunter, both reserved but great chefs in their own right. 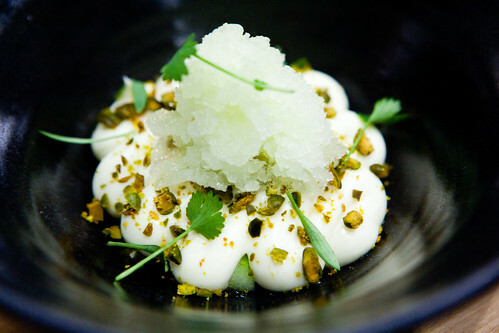 I found his dessert Green made of apple, pistachio, olive oil, cilantro, and white chocolate-yogurt cream to be stellar in flavor combination and plate presentation. 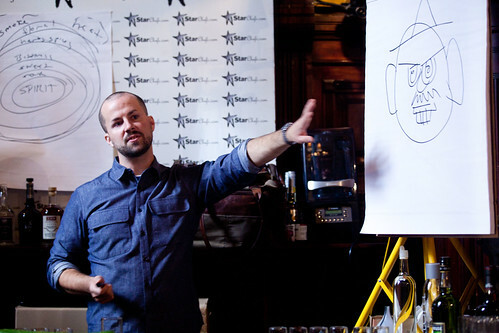 Chef, cookbook author and restaurant owner, Charlie Palmer held a seminar, Translating Creativity from Mentor to Protégé demonstrating the uses of duck and foie gras. 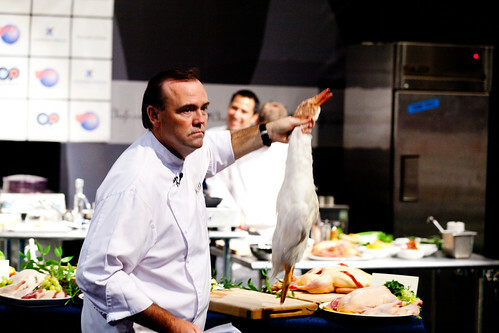 The funny moment was when Palmer was speaking about the breeds of duck and how foie gras look like within a duck, he jokingly threaten to throw a dead duck at an audience member who isn’t afraid of it. 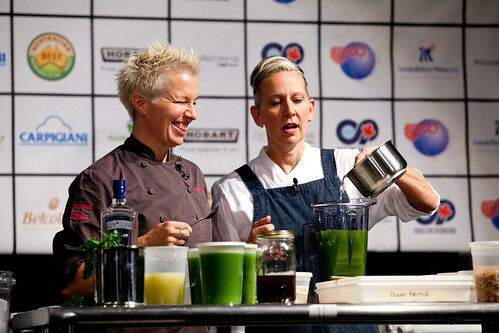 After a lunch break, Chefs Elizabeth Falkner of Orson & Gabrielle Hamilton of Prune. They had fun presenting together and presented their spin on comfort food like Buffalo chicken (Falkner’s dish) and Ants On a Log (Hamilton). 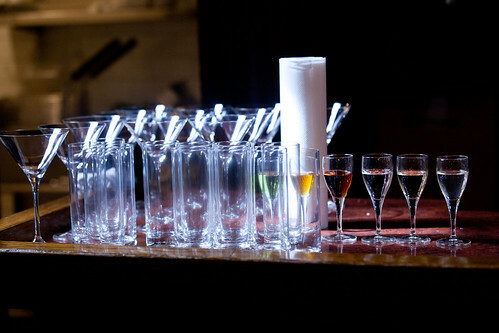 At the end of my day at ICC, I attended one of the cocktail/mixologist gods, Jim Meehan’s workshop: The Logic of Liqueurs. 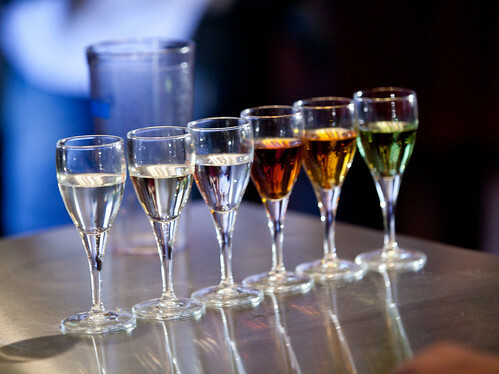 It’s essentially a cocktail basics class tasting our way through six liquors ranging in sweetness, understanding its flavor profiles and how it lends its hand to making a cocktail. To see the photos of my second day at ICC, please click through the slideshow below.